A great way to enjoy the ocean in Hawaii is by kayak. Kayaking is fun and just about anyone can do it—kids and adults! If you’ve never been Kayaking in Hawaii, you might be picturing a guy in a helmet charging the whitewater rapids of a churning river, getting flipped over constantly. Well, that’s not the kind of kayaking we’re talking about. Maybe the most typical kind of kayak is a sea kayak where the paddler(s) sit deep inside the hull and control the steering with rudder pedals—though you might see kayaks like this in Hawaii, this is not the most common kind of kayak for exploring the waters of the Big Island. The kind of kayak that you’ll all around Hawaii is the hard plastic sit-on-top style that’s great for beginners. This kind of kayak is easy to get into and learn how to paddle, so you can spend your time enjoying the view and not mastering the finer points of kayak paddling. Of course you could buy a kayak and all the equipment that goes along with it. But most visitors will be looking for a good kayak rental. Renting a kayak is very reasonable and there are various options all around the Island. You can rent a kayak by the day or by the week. The important thing to be sure of is that your rental comes with everything you need—the kayak (of course! ), paddles, life jackets, straps for your car, etc. Take the time to learn about some great kayaking spots from your rental company too. In Kona, I’d recommend checking out Kahalu’u Bay Surf & Sea. They’re conveniently located right across from Kahalu’u Bay Beach Park, they have great prices and a knowledgeable staff that will help you get off to a good start with your Hawaii kayak adventure. 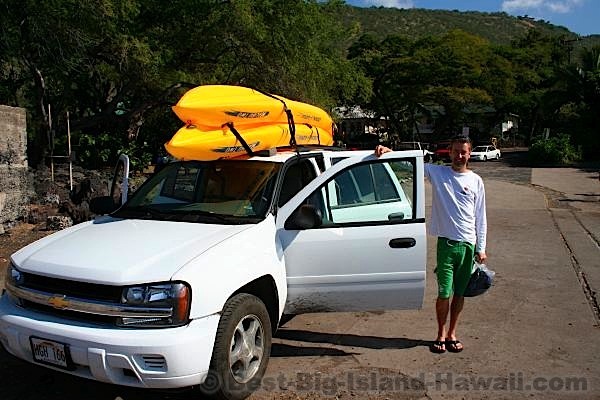 If you’re planning on dedicating a day of your vacation in Hawaii to a kayak trip, it’s not a bad idea to pick up your rental the afternoon or evening before so that you’ll be ready to go first thing in the morning (the best time for kayaking, when the sun isn’t so hot and the surf is often calmer). Rentals are usually for a 24-hour period, so this makes sense timing wise too. Single and double kayaks are available. If you’re not by yourself, sharing a double kayak is fun because you’ll have someone to share the work of paddling and a conversation partner who can confirm that, yes, that was a dolphin that you just saw jump out of the water 20 yards away! Another option is to do a guided kayaking tour. The advantage here is that you get to have someone else handle all of the equipment and logistics while you just show up for the fun. A typical kayaking tour is about 3-5 hours and ranges in price from $99 to over $150 (depending on the length, company, time of day, etc.). Prices for kids are less. The price will usually include all the kayaking and safety equipment needed, dry bags, drinks and snacks, etc. 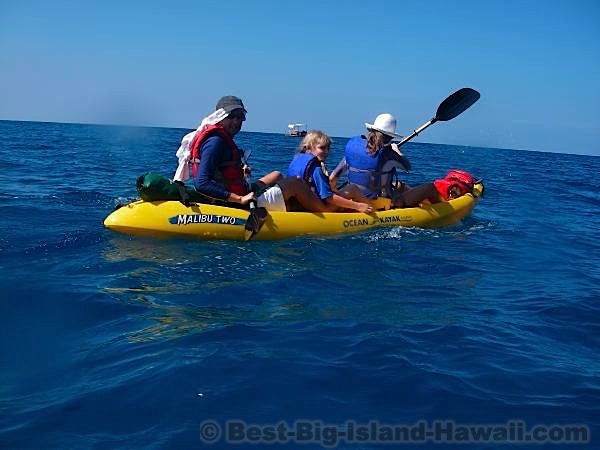 Oh yeah, and of course you also get a knowledgeable guide who will not only teach you how to kayak but also give you some great information about the Big Island and its ocean waters. A guided tour is a great option for first-time kayakers or anyone who’s apprehensive about going out on your own. 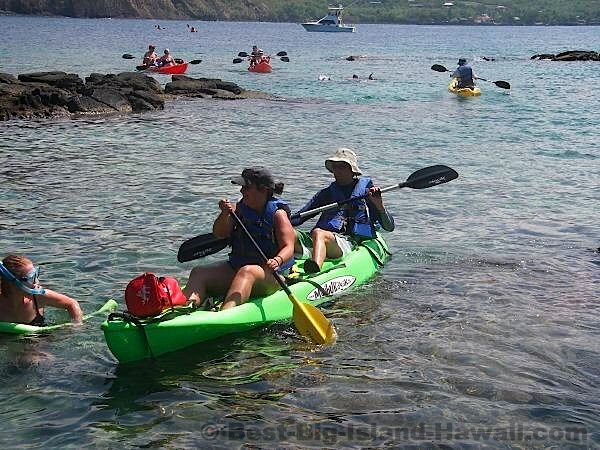 Another great reason to try a guided tour is that it’s currently the only way to explore Kealakekua Bay by kayak. Kealakekua Bay is one of the most pristine and amazing spots to explore the ocean while on the Big Island. It features an amazing coral reef, deep blue waters where whales and dolphins can be spotted, and typically calm conditions perfect for kayaking. In recent years, the Hawaii Department of Land and Natural Resources has been taking steps to protect and preserve this natural resource. This has meant that not just anyone can launch kayaks into the bay for snorkeling excursions. In fact, only two Big Island kayak companies are permitted to take people on guided kayak tours of the bay and its snorkeling areas. These are Kona Boys and the Ahoha Kayak Company. Big Island of Hawaii has kayak spots all over the place. Some of the best beginner spots are very accessible from Kona or Hilo. Beyond these, ask the experts when you pick up your kayaks. They’ll be able to help you find the perfect spot. Keahou Bay — Keahou Bay is known as the birthplace of Hawaii’s famous King Kamehameha III and it’s just a short 15 minute drive south from downtown Kailua-Kona, where it sits at the end of Kamehameha III Road (of course). At the end of the road, you’ll find public parking, showers and restrooms. The bay is very protected and it’s easy accessibility and gentle waters make it a great place to try out kayaking. You can also enjoy snorkeling in the bay. On a calm day, consider paddling out of the bay and turning south to follow the shoreline for about a mile or so. Along the way you’ll find sea caves beautiful cliffs. 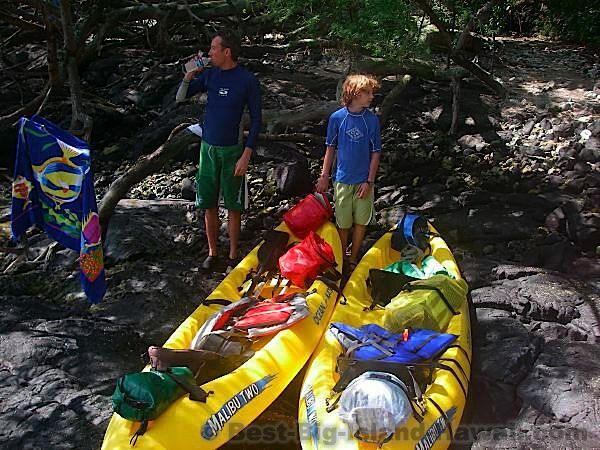 Kealakekua Bay — Kealakekua Bay is probably the best spot on the Big Island to kayak. Not just because of the beautiful ocean views but because it makes such a great kayaking-snorkeling combination trip. The mile or so across the bay gives you a nice chance to enjoy being on top of the water (and a chance to see whales breaching or spinner dolphins jumping in groups). It also gives you a great destination—the amazing reef near the Captain Cook monument where you’ll find the most amazing snorkeling. In case you didn’t read the little caveat above, remember that, by law of the state of Hawaii kayak trips into Kealakekua must now be done with an authorized guide. Don’t let that deter you though, it is well worth it! Find out more about Kealakekua Bay and Big Island Snorkelling in general. Hilo — Don’t worry, the Kona side isn’t the only place for Big Island Hawaii kayak trips. The Hilo side has plenty of opportunities for kayaking too. There are several places to launch a kayak in and around Hilo, such as Beachfront Park and Richardson Ocean Park.